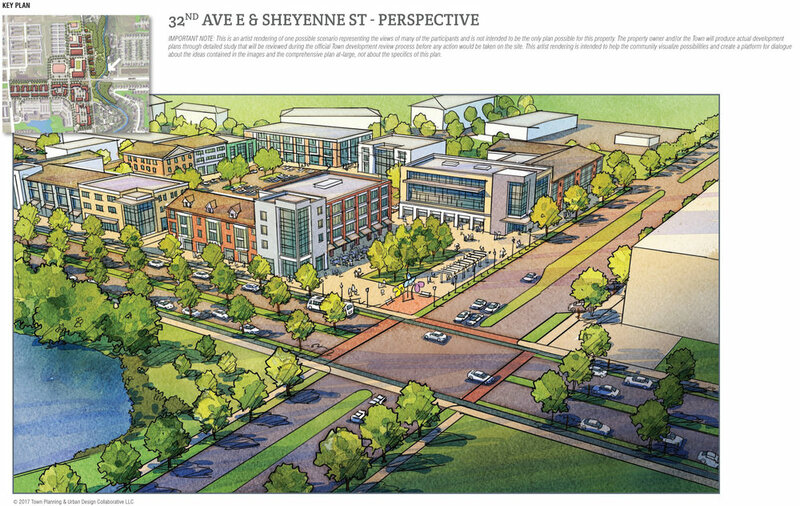 Photo provided by Town Planning and Urban Design Collaborative, LLC (TPUDC). The city of West Fargo has been a growing community for a number of decades. During the decade of the 1990’s the “City on the Grow” was growing at a rate of about 2.2 percent per year, reaching a population of 14,940 by 2000. Much discussion took place about what the community wanted to become when the comprehensive planning process occurred in 1999. The city became a more favorable location for development after 1992 when the Sheyenne Diversion Flood Control Project was completed. Its remaining undeveloped land, which was north of Interstate 94, was developing at a faster pace than previously anticipated. The 2000 Comprehensive Plan considered mid- to long-range development south of I-94. However, development pressure in the early 2000s advanced the city’s commitment to growth through infrastructure projects. The city experienced rapid growth in the next decade with its population increasing to 25,830 (73 percent gain), and the developed land area doubled during that period. The city completed an update to the Future Land Use Plan in 2005 and updated its comprehensive plan again in 2007. By 2016 the population was estimated to be over 35,000 inhabitants. City leaders determined in 2016 that it was important for the community to develop a new comprehensive plan, to provide a vision for the community going forward. With the extensive growth and changing demographics of the community, it was essential to undertake a community engagement process unlike anything previously experienced. The city contracted services with Town Planning and Urban Design Collaborative (TPUDC) who brought a focused and multi-faceted public engagement process to the table. The new planning effort was named West Fargo 2.0. To get people to attend public meetings/events, the City utilized an array of in-person and online tools including word of mouth, eye-catching printed materials, several media outlet announcements, a project’s Facebook page, and a strong web presence (www.wf2point0.com). The website, which included various tools with as a map-based tool, surveys, discussion forums, remained active throughout the entire process with more than 2,500 visitors and more than 5,500 individual visits. The team also used the project’s Twitter account to share information on the project. Final adoption hearings before both City Commission and Planning and Zoning Commission. To involve community residents and businesses that could not attend the meetings, an online interactive tool was utilized via the project website. Graphic provided by Town Planning and Urban Design Collaborative, LLC (TPUDC). TPUDC helped the community establish guiding principles, which are critical to the City’s current and future quality of life. The core philosophy and vision expressed by the citizens is embodied in the principles, which include the following: Healthy, Vibrant, Authentic, Balanced, Welcoming, Connected, Fiscally Responsible, Engaged, Bold, Proactive. In the future, the local context and approach for achieving these goals may change. However, the guiding principles will endure for generations. West Fargo 2.0 provides several strategies for advancing the community which include the following: Grow the Economy, Strengthen Neighborhoods and Expand Housing Choice, Provide Quality and Coordinated Parks and Recreation Services, Promote Transportation Choice and Mobility, Provide Reliable Services and Municipal Transparency, Protect and Enhance Cultural and Natural Resources, Increase Community Resiliency, and Establish Downtown as a Cultural Center for West Fargo. Each of the strategies includes information, ideas and recommended actions. The comprehensive plan sets forth a new framework for growth in West Fargo with ideas and examples of how to accomplish growth in a manner consistent with the vision and guiding principles expressed by the community. A Conservation and Growth Map is established to identify areas of the community where growth should occur, and where new development and redevelopment should be concentrated when opportunities arise. West Fargo 2.0 lays out an action plan, which is a blueprint for implementation for decision-makers. There are clearly defined projects and action items, which identify public and private investment opportunities for a healthy and sustainable community. A series of livability measures will enable the city to track progress on a few key indicators allowing stakeholders to track progress and hold elected officials accountable for implementing the plan. More than anything, West Fargo 2.0 is an exciting magazine-style document that stakeholders are interested in reading. It is the result of an innovative and all-inclusive public engagement process that West Fargo can be proud of. It is West Fargo’s blueprint for a bright future! Change has been a constant variable for West Fargo and is likely to continue. With a purposely guided vision, residents and businesses will have the opportunity to be part of West Fargo’s prosperity. West Fargo 2.0 represents a call for the community to harness the strength of past and capture future opportunities to plan for a city that is redefined as a place to live, work, and play. Larry Weil is the Director of Planning and Community Development at City of West Fargo, North Dakota. He serves on the Western Planning Resources Board.